Via Missouri Southern Lions – Missouri Southern Women’s Soccer head coach Alese Woolard has announced the transfer of Tiffany Laughlin. Big news for the Lions as they acquire an impact player who has spent the first two seasons of her college career filling holes in the Bear’s defense rather than her preferred offensive role. With freshman Bethany Smith’s move to Benedictine Coach Rob Brewer has prematurely lost two of his top three point scorers from 2011, leaving only the unpredictable Shelby Stewart. Laughlin will join Candis Clark, a senior and her new dorm mate, along with sophomore Samantha Zoltanski and freshmen Kacie and Kimberly Hulse as former Pattonville Pirates on the Lion’s roster. Given Pattonville’s position as one of the top public school programs in the State the past four years, Coach Woolard has tapped a strong recruiting pool that will go a long way towards integrating Laughlin into the squad. The team also includes Kelsey Haist (Nixa), Megan Jenisch (Ozark) and Tasha Lord (Waynesville) on the roster. 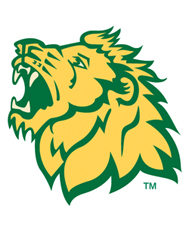 The Lion’s reached the MIAA Championship game in 2011, winning nine of their last 12 games before falling to the #8 nationally ranked Central Missouri Jennie’s 3-1. 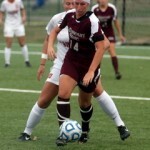 Laughlin comes to the Lions from NCAA D-I Missouri State University. In her two years in Springfield Tiffany scored seven goals and three assists for 17 points, in 35 matches. Laughlin’s game winning header against Northern Iowa in overtime sent the Lady Bears to the Missouri Valley Conference Championship Match at the Cooper Sports Complex. Laughlin wasted little time making an impact on the Bears in 2010 as a freshman as she scored two goals in the home opening win over UALR (8/27/10). Her four goals on the season were second on the team. 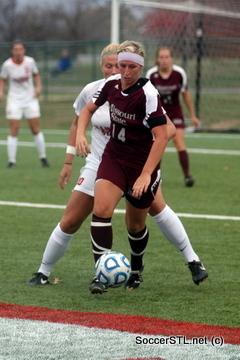 She scored the game-winning goal in the regular season finale against Evansville (10/28/10) to give the Bears a bye into the semifinals of the MVC Tournament. Her two game-winning goals were tied for the team lead. Laughlin was a four-year starter for head coach Tom Iffrig. During her tenure with the team, the Pirates went undefeated in conference play and were district champions her freshman, junior and senior seasons. She was named team MVP and earned all-conference, all-metro and all-state first team honors her senior season while leading her team to a state runner-up finish. During her junior season, Laughlin scored 11 goals and tallied 18 assists while earning first-team all-state, second-team all-metro and first-team all-conference honors for a Pirates team that finished third in state. Her sophomore campaign netted her an all-conference second team honor after she scored six goals and 23 assists, the most in the Suburban North Conference. Laughlin was named Rookie of the Year after her eight goal, 22 assist output as a freshman. She was also named all-conference first team, all-metro third team and all-state honorable mention accolades her freshman season. Laughlin was a place kicker for the football team her senior season.